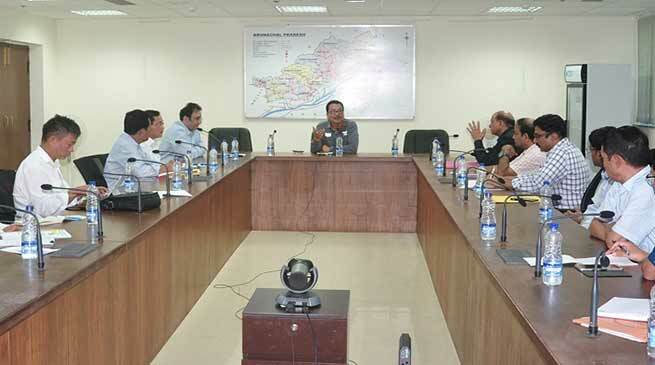 “Planning and monitoring of works is crucial” said Deputy Chief Minister Chowna Mein in the high level meeting with the Commissioners & Secretaries of all the departments of Government of Arunachal Pradesh which was convened to identify key projects that are to be communicated to the Government of India for incorporating in the Union Budget 2018-19 in his Civil Secretariat Office here today. He called upon them to have a focused approach for accelerating the pace of development in their respective departments. He asked the senior bureaucrats of the State to propose innovative schemes for inclusion in the Union Budget 2018-19. He also said to give emphasis on proper implementation and monitoring of all the centrally sponsored schemes. He further appealed them to work harder to realise the objectives set in Vision 2020 and New India Movement by the Prime Minister Narendra Modi. He further said that we can no longer remain in the old system of working in the present competitive world but have to upgrade ourselves in this age of Information Technology to catch up with the rest of the nation. Development Commissioner for Finance, Planning & Investment, Ashish Kundra in his introductory speech highlighted the objectives of the meeting. He suggested the proposals to be sent to the Union Govt in a consolidated form. Commissioners and Secretaries of all the Departments of State Govt attended the meeting.